Happy Monday, everyone!! I took about 3,875,951,632 pictures this weekend, so I'll keep my words brief and just let the pictures do most of the talking. 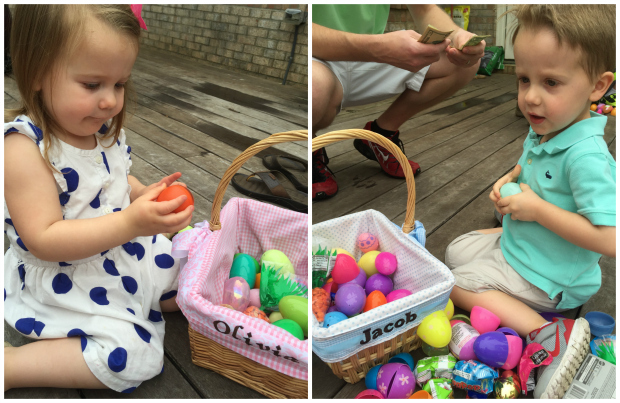 Our Easter weekend was long and fantastic! 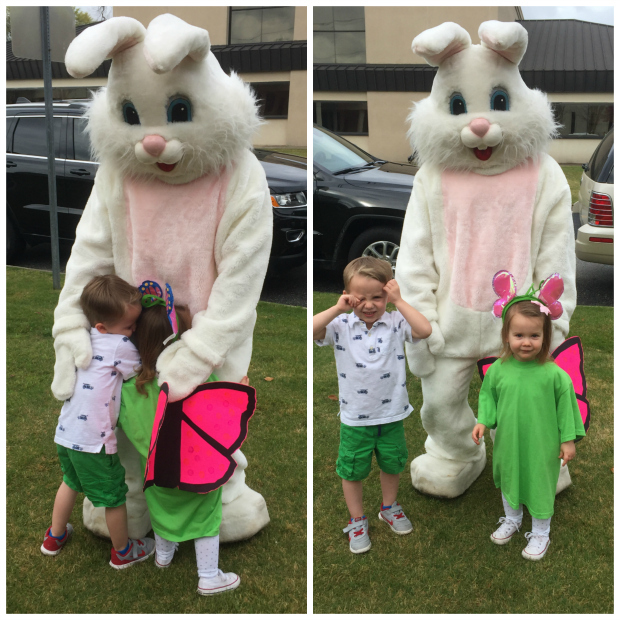 We kicked it off Wednesday afternoon with an Easter egg hunt at Olivia's school. We were unintentionally twinning so we had to take a picture. 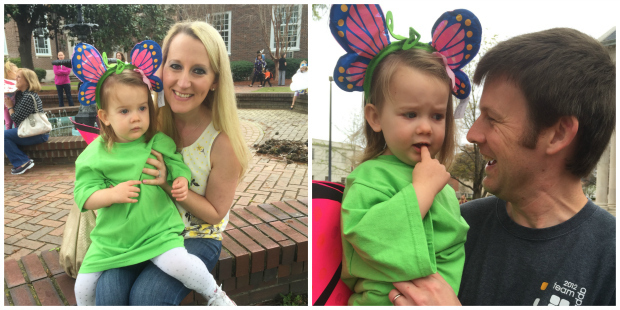 Friday was the Easter parade at Olivia’s school. Since I was off with Jacob, I kept Olivia with me when it was over, and we had some play time on the playground at the mall followed by lunch with Cokie at Panera. 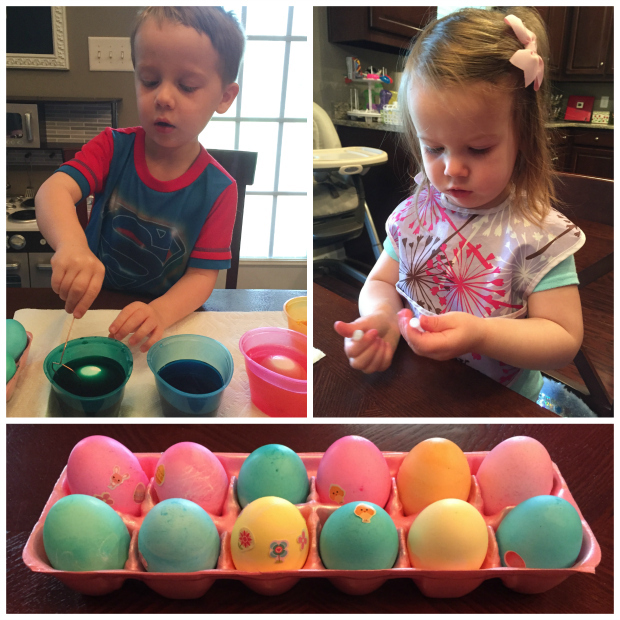 Saturday, we dyed some eggs (which is super stressful with a 4 year old and a 2 year old in case you were wondering), had a big lunch with Brian’s family, celebrated his mom’s birthday, and had our annual Easter egg hunt for all of the cousins. 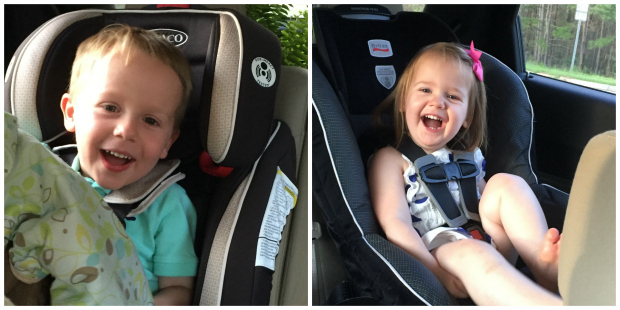 After lunch and naps, we took a little trip to Lowe's and the kids had fun laughing at Daddy's crazy singing in the car on the way! 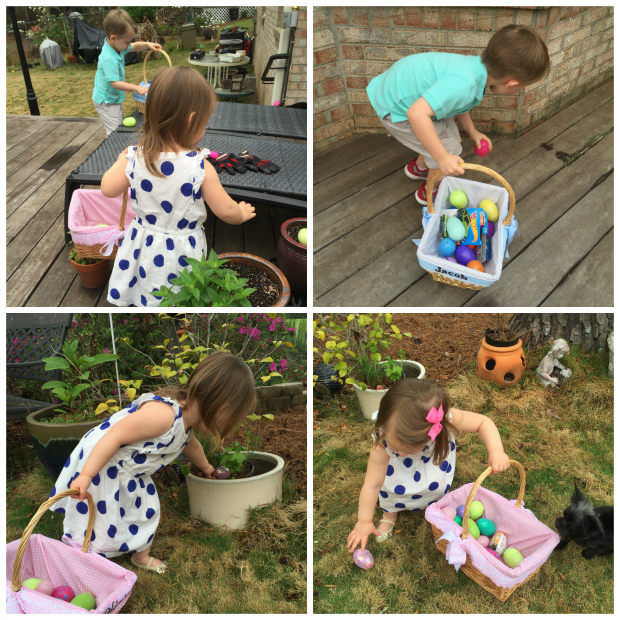 We ended the day by preparing for Easter - laying out clothes for church, getting the Easter baskets ready, and then B and I watched a couple of episodes of Fuller House before bed. Still haven't finished it yet! Sunday we went to mass to celebrate - He is risen!! Easter is one of my favorite masses of the whole year because it's just so joyful! After mass, we had a big lunch with my extended family and we also celebrated my cousin's birthday which is later this week. Although the weather wasn’t ideal, the rain held off for the most important parts of the weekend, and we could not have asked for a better weekend. Your pictures from this weekend are gorgeous! 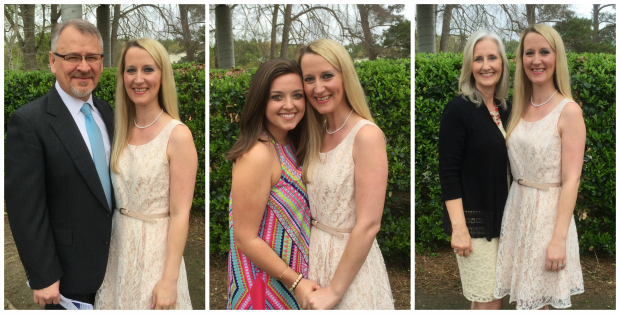 Glad y'all had such a wonderful time together, and I love your family's Easter outfits! Love seeing your weekend through pictures. Went a wonderful time spent with family! Everyone looks so handsome & pretty! Love all of the pictures!! 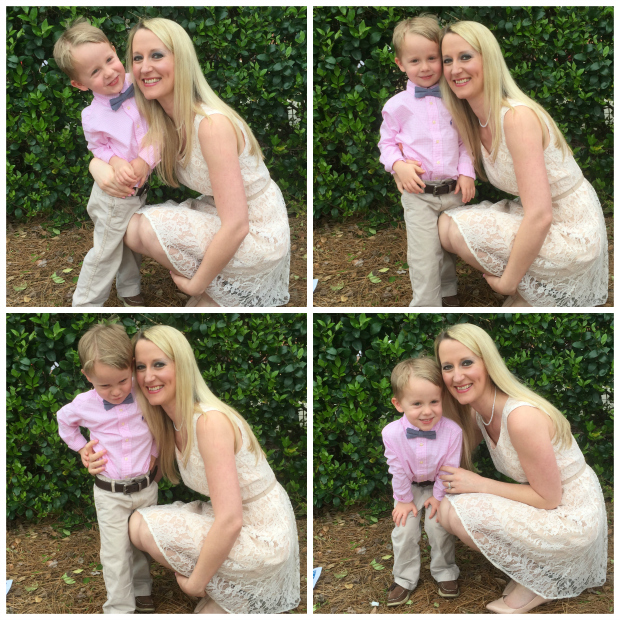 I love the dress you and Olivia wore for Easter and the boys looked so handsome! Your eggs turned out so good! 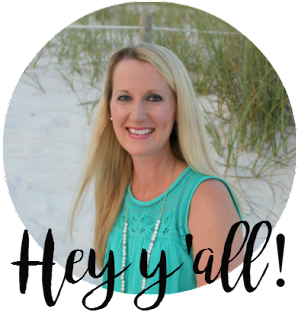 Love all those sweet family pictures! You guys had such a lovely weekend! Loved y'all's outfits and I find it so adorable how Olivia stands there and takes and OOTD with you, she is precious! 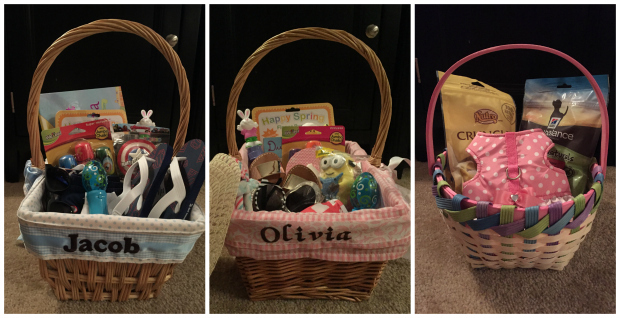 Both of your kiddos are...and I love that you fixed up an Easter basket for Maui! So sweet! Aw you got some great shots Lindsay! I love the ones of the four of you outside. So pretty and natural. The ones of you and Olivia and your husband and Jacob made me smile. So glad it was a great weekend! 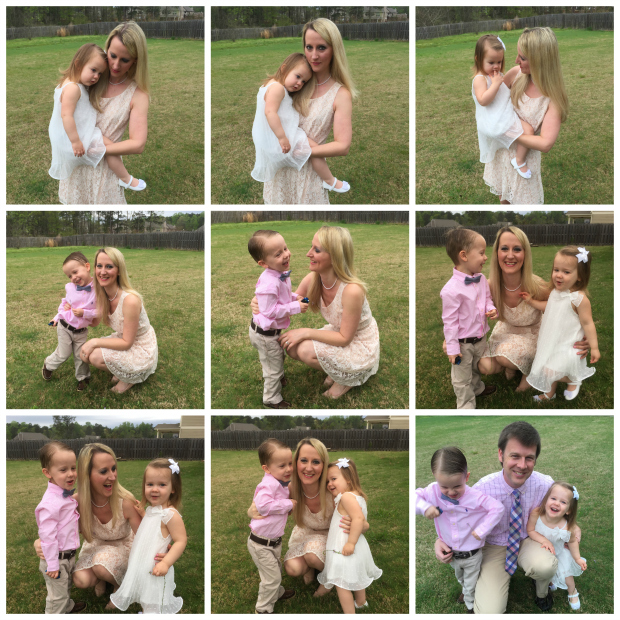 What great family Easter shots! 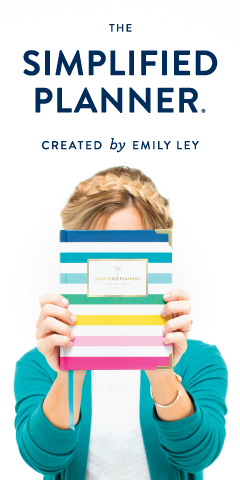 Sounds like a pretty fantastic weekend! Fun that you were able to celebrate your cousin's birthday as well! I love that you even got Maui an Easter basket. It honestly never occurred to me to get one for Leonidas - I'm a terrible dog mom. Although my dad did include him in the egg hunt at their house he ended up with 6 eggs full of treats! Everyone looks so wonderful and you look absolutely stunning as usual. Oh and guuuurl, you know how I feel about dyeing of the eggs. It.was.cray!!!! Right?! That little bowtie just kills me every single time. And thank you so much as always for your sweet comments! looks like everyone had a wonderful easter. loved the baskets! You have such a beautiful family. Loved your dress that you picked for Easter. 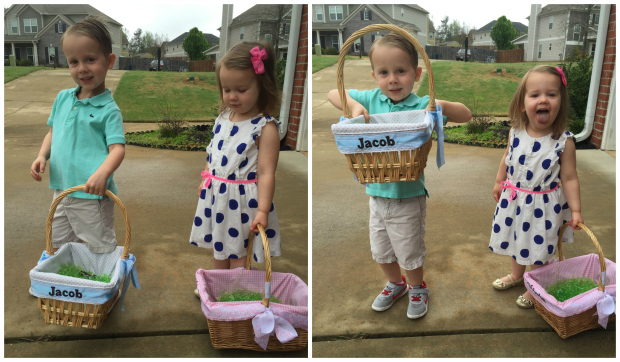 So cute seeing your kids hunt for eggs. 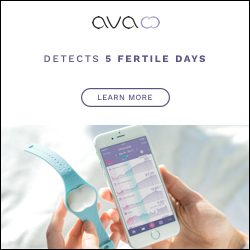 I bet the coloring of eggs was very stressful.